When Judy Henderson woke up one morning with blurry vision while on vacation in April 2017, she thought she might be going blind. But she couldn't get in for an appointment with an ophthalmologist for four days. By then, her vision was back to normal. Before she and her husband flew home to Cincinnati, however, her vision became blurry again. As soon as she got back, Judy made an appointment with a local eye doctor, who said her eyes were fine. 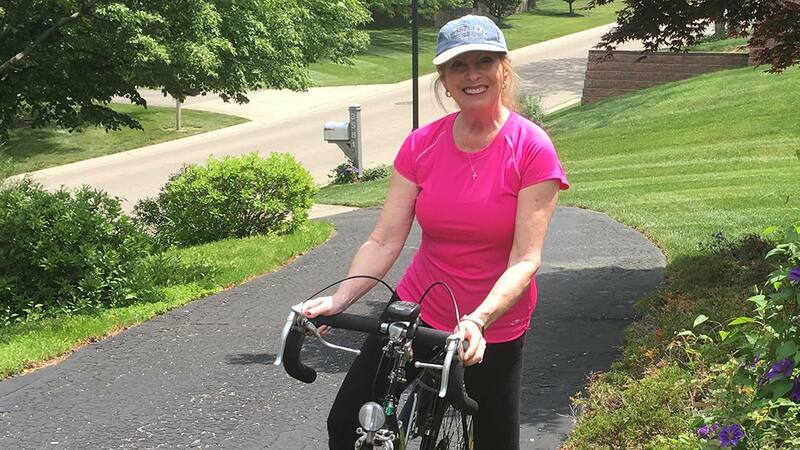 Judy pursued more evaluation until the source of her vision problem was revealed: a complex brain aneurysm. Local doctors told Judy there was nothing they could do. Unwilling to leave it at that, Judy traveled to Mayo Clinic for a second opinion. The neurosurgeons she met with saw a way forward. They were confident a device recently approved by the Food and Drug Administration (FDA) could work for Judy. And they were right. Today Judy's aneurysm is a thing of the past, and she's grateful for the chance to enjoy the years ahead. "Every day I wake up, I thank God for my life and my vision," Judy says. "I have a whole new perspective on life. I'm not going to work as hard. I'm going to enjoy life and my family. That's what life is all about." After she returned home from her vacation, Judy's concern grew. She'd see well for a week. Then she'd have blurry vision for three or four days. Judy wanted answers, so she went to see her primary care doctor for a physical. He told her she was in good health but recommended an MRI to put her mind at ease. When the MRI didn't show anything, Judy insisted on finding out what was causing her vision problems. Her primary care doctor referred her to a neurologist who scheduled a magnetic resonance angiography in late September to examine the back of her head. Results of that imaging test uncovered the shocking source of the problem. Judy had a 7-millimeter brain aneurysm — a bulge in a brain blood vessel that can cause a life-threatening leak or rupture. The aneurysm was situated behind Judy's eyes, deep in the middle of her brain. The neurologist's assessment was grim. "He told me it was in a terrible location, and it was too risky to operate. He recommended I keep my blood pressure down and try to enjoy my life," Judy says. "I felt like a ticking time bomb and cried all the way home." Thinking she didn't have much longer to live, Judy decided to spend time with her family. She scheduled two trips to visit her children and grandchildren — one to see her son who lives in Malibu, California, and the other to visit her daughter in Dallas. "When you think you're going to die, and you don't know when, you want to see the people you love," Judy says. "I tell them every chance I get how much I love them." Judy's family and friends wanted her to get a second opinion. Spurred by their encouragement, she contacted Mayo Clinic. "I felt like I was fighting for my life," Judy says. "Mayo is the best, so I called Mayo." Judy got an appointment with David Piepgras, M.D. and Giuseppe Lanzino, M.D. — both neurosurgeons at Mayo Clinic's Rochester campus. After evaluating her condition, they confirmed that Judy's aneurysm was complicated, but she wasn't without options. Dr. Lanzino told Judy he could help her with a new device recently approved by the FDA called a PulseRider. It would be used as part of a procedure known as endovascular coiling, in which a brain aneurysm is treated by placing a wire coil inside the aneurysm to disrupt blood flow and seals off the aneurysm from the artery. "Mrs. Henderson's aneurysm had a wide neck in an artery that branches into two vessels. With coils alone, we could run the risk of them protruding or escaping into the normal vessel, causing serious consequences," Dr. Lanzino says. "In those cases, we have to use something to support the coils and keep the aneurysm from bursting. The new device has leaflets that cover the branching point of the artery, which increases our ability to safely treat patients with complex aneurysms." Confident in her care team's skill, Judy agreed to the innovative approach. "It was like night and day from my local doctors. They did all these tests only to tell me there was nothing they could do," she says. "Dr. Lanzino is so confident and has a way of putting you at ease. He said, 'I think we can take care of this, and you'll live a much longer life.'" On Nov. 20, 2017, Judy became one of the first patients in the U.S. to undergo the procedure, during which Dr. Lanzino and Leonardo Rangel Castilla, M.D., advanced the soft, flexible wire coils via a catheter through the groin to the brain, closing the aneurysm. After that, the surgeons placed the PulseRider device to prevent the coils from protruding into the normal vessel. The procedure was a success, and Judy is thrilled with the results, as well as her overall care at Mayo Clinic. "I was up the next day walking. It's really a miracle,'" she says. ""Without Dr. Lanzino, I probably wouldn't be here. He saved my life." Learn more about brain aneurysms. Dr Lanzino and Mayo went to FDA for compassionate use approval on my aneurysm in 2009. Aneurysm repaired with pipeline stents as it was only option as no surgeon would dare operate on mine due to size and location too. Miracles are made at Mayo. Was your aneurysm a ruptured or unruptured ? I lost my wife recently from ruptured aneurysm.